Remember how lucky I have been lately? The trend continues! Sarah at The Plucky Knitter sent me this beautiful skein of incredibly soft merino sock yarn in the most gorgeous shades of blue. Sarah's a new indie dyer, and she has an amazing eye for color, especially for subtle variations in dreamy shades. Check out her Etsy shop! Simultaneously teaching summer session and starting a new job while trying to work on my research has been exhausting. I'm half done with my second Waterloose sock, and I need to cast on for the Sockapalooza socks ASAP. The Kai cable pullover just needs seaming and finishing. 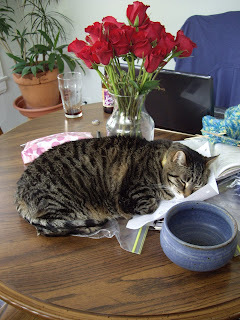 I have been puttering around in the kitchen some (when it isn't too hot). This recipe for Rhubarb Streusel Bread turned out quite well -- moist and fruity, with a little cinnamon-sugar crunch. Looming in the back of my mind was a sneaking suspicion that a handknit baby blanket composed of squares was not a good idea. Indeed, it was a bad idea. 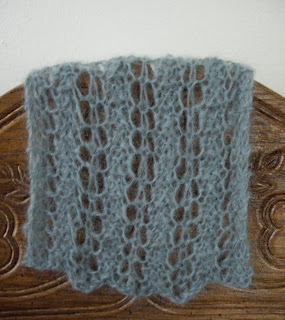 The navy blue squares are larger than the light blue squares even though they are all knit from the SAME YARN (RYC Cashsoft 4 ply, doubled) on the SAME SIZE NEEDLES. The camera angle makes it look a little worse than it actually is, but it's pretty bad nonetheless. This was a stashbuster project, and I'm not happy. 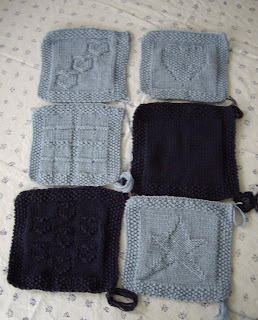 At least I've only completed 6 of the 12 squares. On a brighter note, the Capricha's lot in life seems very luxurious indeed. I sent off a pair of Irish Hiking wristwarmers and a Skye hat to Mia a while back. 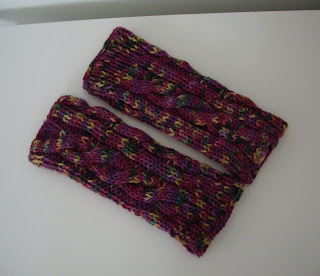 The wristwarmers were an easy knit, and the cables are so much fun. 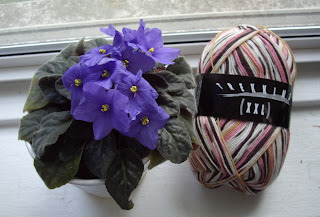 Notes: The yarn's colors are simply gorgeous, and the dyer did an amazing job. It's not the softest yarn ever, though. Notes: The lacy pattern shows up much better when stretched out on an actual head. 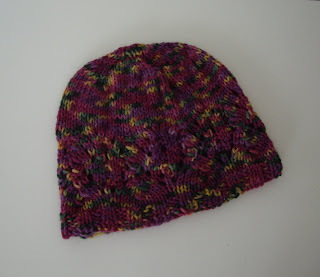 I didn't want to get my head germs all over the newly-washed hat before I posted it, though! 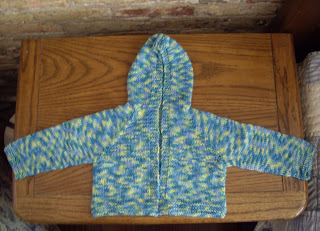 The easy baby cardi just needs some sort of fasteners. The pattern suggests crocheted yarn cords or ribbons, so I need to do a little thinking on this one. Alyssa just knit a very cute, hoodless verson of this same sweater, and she decided to omit fasteners altogether. Yarn: Jaeger Baby Merino DK - "Marbles"
Notes: I love the pattern because it's so easy to follow. There is just one seam to sew up -- the hood. Next time I'll try the hoodless version. The yarn was OK to knit with, but not great. It had that slightly unpleasant, sticky superwash feel. The sleeves seem really long to me (and the body very short), but I don't have that much experience with babies' arm length, so I'll wait and see. I went down a needle size to get gauge knitting flat. 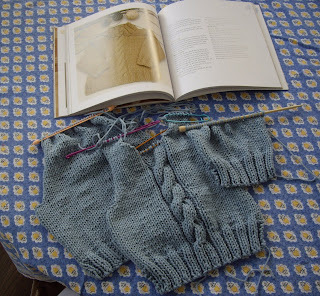 I learned that my gauge is definitely different on DPNs -- I should have gone up to size 7 for the sleeves. 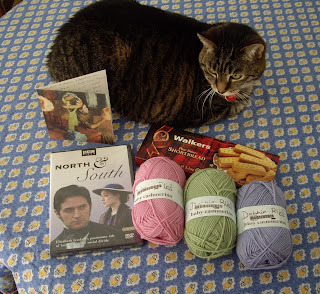 Amy sent me a fabulous Knitflix swap package! Kylie's helping with the photo shoot, of course. Like me, Amy is a self-professed Anglophile, and she sent me the BBC adaptation of the Elizabeth Gaskell novel North and South that I have been wanting to see ever since I saw Wives and Daughters. I start teaching an intensive Latin class tomorrow, and this is going to be the perfect way to relax on weeknights. There's also some yummy looking short bread (which will be perfect with a spot of tea and some knitting) and lots of beautiful Debbie Bliss Baby Cashmerino, which I adore. The card is a Degas painting from the Art Institute of Chicago. Thanks, Amy! You read my mind on this one. I'm on a roll! 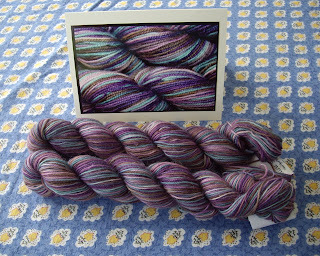 Jen, the Woolgirl herself, sent me two skeins of Liisu Yarns' new Waves of Memories colorway from her blog contest. What beautiful yarn! It's 75% superwash merino, 25% mohair, and it feels so nice. I love the mohair glow. Thanks, Jen! BTW, Woolgirl has tons of great yarns in stock, and Jen packages everything so nicely and often throws in little goodies. 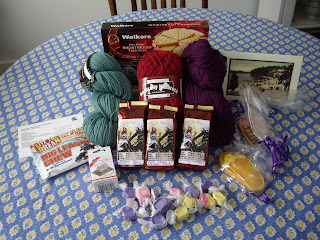 A Knitter's Tea Swap package arrived from Kaetlyn today, and it is just perfect. There are three delicious teas from Alice's Tea Cup. I'm drinking a cup of High Noon, a hibiscus blend right now, and it is so yummy. She sent a card from Buffalo, her hometown, as well as shortbread, super cute cookies, taffy (which I didn't even know that I liked -- now it's almost gone), and a bag of Big League Chew, partly in reference to the fact that I live pretty much within spitting distance of Wrigley Field. And the yarn! Cascade 220 in a lovely green and a deep plum, as well as Kraemer Yarns in a beautiful cherry red -- my favorite (non-blue) colors exactly. Thanks, Kaetlyn! I *heart* cables. The little Kai sweater is knitting up very quickly. 1.5 sleeves to go, then all the finishing. I've been awfully lucky lately. 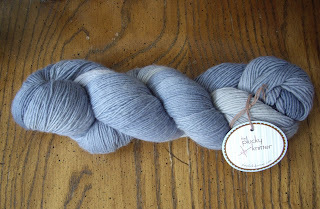 I just won a skein of this Trekking yarn in Alyssa's blogiversary contest. 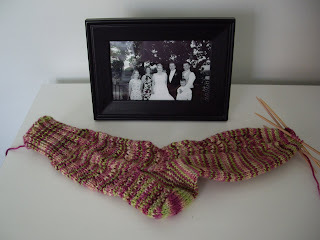 She knit a very cute pair of socks using this very same yarn last year. The perennially wonderful Alicia made a similar pair, too. I can't wait to make my own! 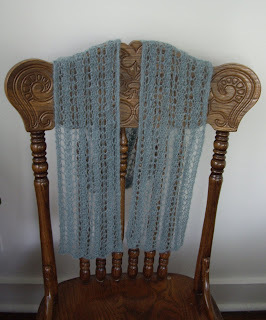 The Carpathia-esque scarf is done and dusted. I made a few minor modifications to the Cider Moon pattern, mainly to make it wider and keep the edges from rolling. I used GGH Soft Kid and size 9 needles. The baby knitting frenzy continues. 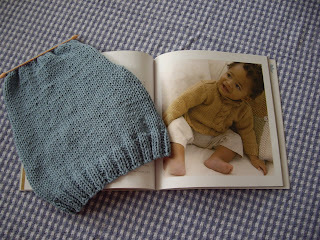 I'm working on the Kai Cabled Sweater from Louisa Harding's Natural Knits for Babies and Moms. It's a marvelously easy pattern so far, and I'm using Cotton-Ease for the first time. Works great so far. I find the new Cotton-Ease color palette very odd, but at least it's not all bright, garish colors. If I have any leftover I may knit a Saturday Market Bag. - Knit Picks is having a sale! I ordered enough Andean Silk in "leaf" for the aran bag from a few posts ago. The plan is to line it with some pink and green print fabric from Heather Bailey's Freshcut line. 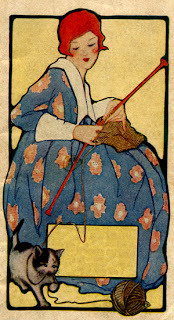 - This French cross-stitch website features lovely free patterns available for download. Check out the "grilles et diagrammes" section first. - I'm making this delicious and incredibly easy " very strawberry cheesecake" for a knitting/crafty party tonight. If you don't mind the unnatural ingredients of Cool Whip, this is the perfect fruity dessert to make in advance when you don't want to heat up the oven. Spread peanut butter over bottom of pie crust. Layer ice cream on top, filling crust just under half way. Sprinkle cookie crumbs. Drizzle chocolate syrup. Add another layer of ice cream and smooth gently with spatula. Top with a drizzle of chocolate syrup. Freeze, covered, for 2+ hours. This post is kind of a mishmash. It has been that type of week. I spent last week pondering a job offer from a scholarly journal in my field. After much debate, I decided to take it. Pro = more $ for yarn; con = less time for knitting. It will be a good (and hopefully inspiring) experience, and it shouldn't cut into my studies too much since it's not full-time. BTW, I installed Haloscan the other day and lost all my comments! What a bummer. - The first Waterloose sock just needs to be kitchenered. I'm halfway done with the last sleeve on the baby sweater, too. - Williams-Sonoma now features a stainless steel Kegerator in their catalog. Does that strike anyone else as odd? 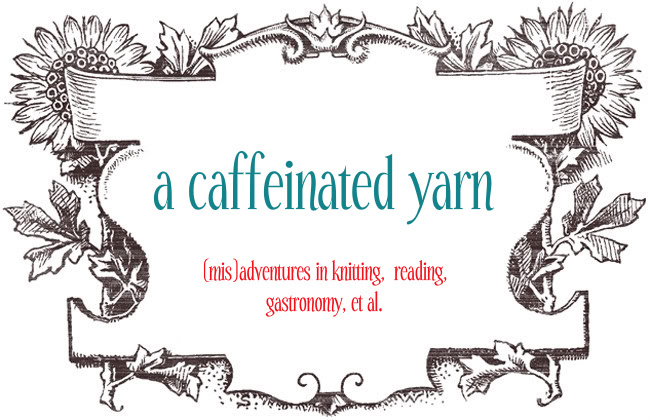 - Ravelry rocks. It's awesome to see what people are knitting, and it's a great way to get organized (and waste time). Feel free to friend me! My handle is jmharaldson -- clearly I didn't put much thought into that choice, but whatever. 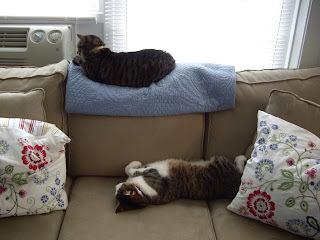 - Cats are very strange beasts. 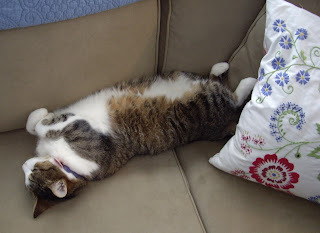 Does this strike you as a comfortable way to sleep? Not me. - I love following the progress of the little gnomes in the Knitting Gnome Swap. So much whimsy! I'm all about the whimsy. I can't wait for a little guy to show up on my doorstep. - Have you heard about Paperback Book Swap? What a great idea. I just signed up, sent out my first few books, and am waiting for a few to come my way. Mia, this might be the perfect solution to your book overload.